ICIS price assessments for polyethylene (PE) are widely used by market players globally in contracts and trade deals. Our reports provide you spot and contract prices for key PE grades, as well as feedstock prices and trends drawn from our global network of trusted sources. Polyethylene (PE) supply is expected to increase with the arrival of new imports from the US in the first quarter. This could be tempered by a planned cracker maintenance programme, which will curtail some ethylene output in Europe in 2019. Overall, the situation is unclear, as much depends on the level of demand, and the uncertain economic situation. 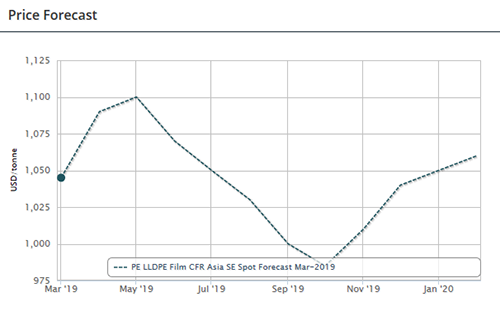 Polyethylene (PE) demand is expected to be impacted by fresh imports from new US capacity in particular in the first quarter of 2019. Buyers have been expecting volumes for some months, and Q4 2018 began to see their arrival. A planned cracker maintenance programme is expected to curtail some ethylene output in Europe in 2019, so this could have an effect on demand in the first quarter, as buyers ensure security of supply. Supply levels are anticipated to remain long in the North American market. Sasol’s new 470,000 tonne/year LLDPE plant in Lake Charles, Louisiana will ramp up rates after starting up late in the fourth quarter, while additional new capacities are expected to come online later in the year. Domestic demand for PE will continue to find support from healthy economic growth figures in the US. 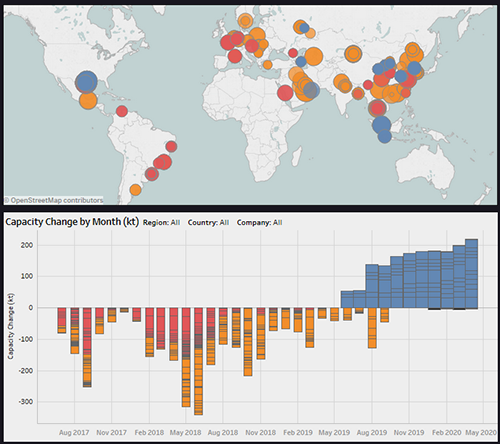 Export sales will continue to rise as US producers increase their export focus, although economic woes in some emerging economies may depress prices. The pace of purchasing from China following the Lunar New Year in the first quarter will be closely watched as an indication of sentiment in the world’s largest PE consuming nation. Local supply in China is set to increase in Q1 as several plants resumed production at the end of December. Import supply from Iran to China could tighten amid shipping restrictions due to US sanctions. There’s expectation of a supply glut amid more import supply from overseas producer although there is no expansion plan in southeast Asia. Demand in China is expected to increase in Q1 amid restocking before Lunar New Year holiday in early February before it slows down during the long holiday. 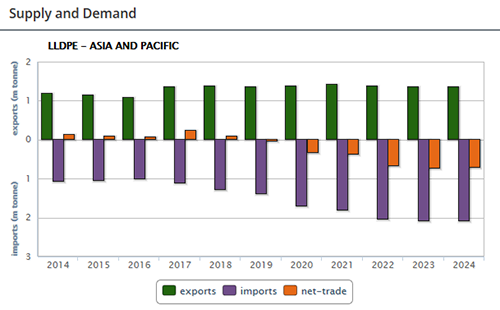 Buyers in southeast Asia might continue to hold bearish sentiment and thin buying appetite for imports amid subdued end-product demand and competitive local prices. PE availability will remain long in the first quarter of 2019. US sellers remain keen to develop market share and Middle Eastern players will look to maintain theirs. The current halt in the US- China trade war may see more US exports heading to Asia. The US suppliers have been aiming to establish a presence in Africa before the trade war began so are unlikely to stop providing material to Africa. Demand levels are expected to remain fairly stable until after the Lunar New year holiday in China. There is very little clear direction in the market at the moment. Many players are looking for a trend to establish before making moves in the market and see Chinese demand as being the factor that will pull the market one way or the other. Supply levels are expected to remain strong, with even more polyethylene (PE) production due to come online in 2019. There is unlikely to be any outright shortages of any grades although relative supply levels may fluctuate depending on external factors, such as Chinese demand. If demand improves in Turkey it may show availability to not be as extensive as it currently seems. Iranian sales are down and may result in some shortness on certain grades. The first quarter is unlikely to see any major improvement in demand levels. Most sources agree that improvement will be slow, as it relies on improvement in currency and the economy, as well as political stability. The municipal elections in March are another issue in the first quarter to generate uncertainty, preventing recovery. If demand improves in Asia, that may generate some a similar trend in Turkey but the market remains constrained by financial issues. PE supply is likely to increase further as US producers ramp up operating rates at the shale-based PE plants. A change in traditional tradeflow routes is also set to emerge from Q1 onwards. US sellers are likely to target markets outside of China in view of the trade tariffs applicable on selling to the latter. Middle Eastern producers are likely to focus on the Chinese import market and attempt to realise better netbacks selling there. Demand is likely to strengthen in Q1, as regional processors look to restock inventories early in the year. However, this could be offset by the introduction of the value added tax (VAT) in Bahrain, as buyers may delay or curb purchases while adjusting to the workflows and paperwork surrounding the new tax regime. PE supply is expected to be steady in the first quarter of 2019 without major turnarounds announced. However, it is likely that operating rates could be reduced in some countries if demand does not return. The situation in Venezuela will not change, with plants operating at low rates when feedstock ethylene is available. Demand could decline in the region with continued economic problems in Argentina brought by the devaluation of the currency. Usually, the impact of currency exchange shocks does not last long, but it has affected Argentina, Brazil, Chile and Colombia in recent months. Demand is expected to be normal in Mexico and in Brazil, countries with new administrations. 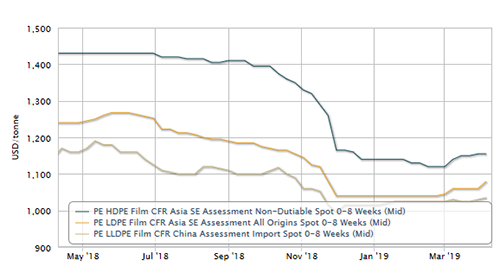 ICIS publishes pricing reports for key polyethylene grades and offers timely and in-depth market data, including price assessments, trade activity, feedstock supply and analysis of each region’s current and upcoming export availability. Subscription to the ICIS polyethylene pricing reports includes complimentary access to our petrochemical analytics platform providing you with a 360-degree view of the market. 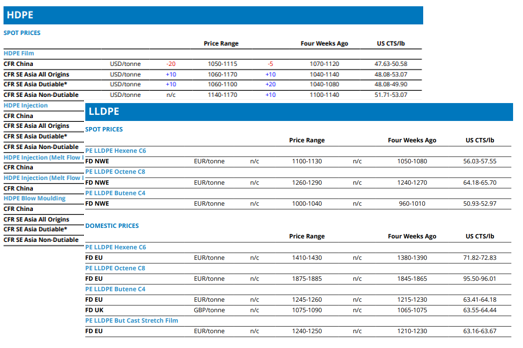 Plan your market position with ICIS 12-month rolling price forecast. Understand where the market is heading to shape your short-term pricing and negotiation strategies. Our concise monthly reports include details of prices, margins, capacity, supply and demand for the next 12 months. The reports are quick to read and support fast decision-making. ICIS brings you breaking chemical news as it happens – including market moves, analysis, data and more. The service is reliable, authoritative and always available when you need it most. Stay on top of polyethylene and other related commodities such as its feedstocks across all regions with ICIS news. Gain a long-term view of the market with ICIS Supply and Demand data (1978-2040), which offers end-to-end perspectives of the polyethylene supply chain – HDPE, LDPE, LLDPE, ethylene and crude. Choose ICIS for concise information and easy-to-assess formatting, all delivered straight to your inbox. Make better business decisions by using our powerful analytics tools to gain a 360 degree view in today’s polyolefins and plastics markets.